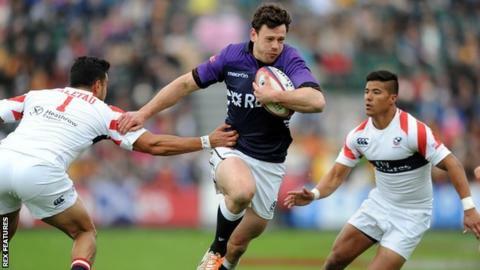 Wasps have signed Scotland centre Nick de Luca on an initial short-term deal from French second-tier club Biarritz. The 32-year-old who has won 43 caps, the most recent in 2014, began his career at Edinburgh before moving to France in 2014. "I followed the team's success last year and I'm excited by their ambition and their style of play," he told the club website. De Luca is the Premiership club's 11th signing ahead of the 2016-17 season. Director of rugby Dai Young has bolstered Wasps' midfield following the retirements of Andrea Masi, Ben Jacobs and James Downey and injuries to Samoa international Alapati Leiua and Australia's Kurtley Beale. "We have initially signed Nick on a short-term deal as injury cover," said Young. "But we are not ruling out a longer-term agreement. "I have only seen and heard good things about Nick in terms of his attitude, ability and application. He has already proven himself as a top professional and an international rugby player." Wasps scrum-half Joe Simpson has been ruled out of contention for the Olympics Games sevens in Rio after dislocating an elbow in training. Simpson, who was one of a handful of XV-a-side players in the wider Team GB 7s training squad, is still expected to be available for the start of the Premiership season in September. "We're obviously all really gutted for Joe," said Young. "He was progressing well and pushing hard for a place in the squad and it's desperately unfortunate that he has picked up an injury that will now rule him out. "On the flip side of that, we're all looking forward to having Joe return to Wasps. He is an influential character and will now be getting his head down to prepare himself for the start of the new season."